I just had a watershed moment. I realised that whenever the watershed Singapore general election of 2011 is mentioned, it must be referred to as a “watershed election”. Otherwise, the watershed police will come and arrest you, and possibly put you in a watershed. So what made the watershed election such a watershed event? For one thing, it was the first election where Twitface (also known as Twitter and Facebook) played a major role. Social media’s impact was so great that the influence of the Internet can still be felt weeks after the watershed election. Last month, Member of Parliament (MP) Lim Wee Kiak withdrew and apologised for remarks he made about ministers’ salaries after much criticism online. 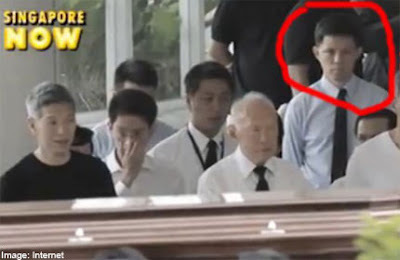 Another MP, Major-General Chan Chun Sing, refuted online speculation that he’s related to Mr Lee Kuan Yew. By responding to online comments, public officials are acknowledging and thus, ratifying and bolstering the power of the Internet to affect public agenda. This wouldn’t have happened before the watershed election. But as it turns out, all this political stuff was mere build-up to the ultimate display of social media’s awesome might last week. 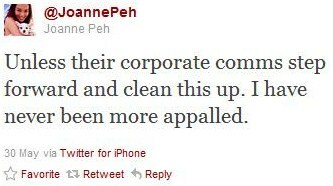 Actress Joanne Peh tweeted about an unpleasant restaurant experience and it was national news! In her own less-than-140-character words, she threatened to never return to Nando’s restaurant “unless their corporate comms step forward and clean this up". That’s right, the whole history of the Internet - the invention of the World Wide Web, data plans and Twitface - was to make it possible for an over-entitled TV star to get an apology for bad service, which she did. If only you and I were so privileged. Peh’s main grouse was that the restaurant staff members had clapped when she walked out. Perhaps they thought the actress was researching a new role as an annoying customer and were applauding her convincing performance. At least she got their attention. When I go to a restaurant, I practically have to remove my top and wave it like a flag just to get the bill. If I were to tweet about bad service, I doubt any restaurant would respond. My wife would just tell me to stop taking off my shirt in public because she’s my only Twitter follower. But then I didn’t win a best actress award for my role in The Little Nyonya and I’m not dating a hunky Caucasian, partly because my wife won’t let me. But I may just go to Nando’s at Tanglin Mall and ask for hot water. Now that would be a watershed moment. UPDATE: Six days after the storm in a tea cup over Joanne Peh's request for hot water at Tanglin Mall's Nando restaurant, Tanglin Mall is flooded during an actual storm. From her tweets to God's ears. Talk about the power of social media. Another watershed moment!